The KBP Instrument Design Bureau, US/NATO designated AT-4 'Spigot' (industrial index number 9K111, name Fagot: Bassoon) entered operational service in 1973 and is a wire-guided second-generation medium-range Semi-Automatic Command to Line Of Sight (SACLOS) tube-launched Anti-Tank Guided Weapon (ATGW) for use from ground or vehicle mounts. 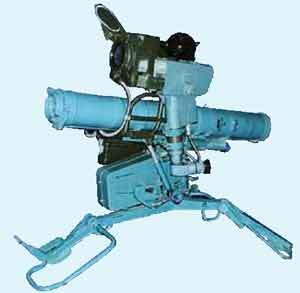 The 9K111 Fagot missile system was developed by the Tula KBP Design Bureau for Instrument Building. All the gunner has to do is to keep the cross-hairs of his sight on the target until the missile impacts. The basic 9M111 (AT-4a 'Spigot') missile uses a 1.7 kg High Explosive Anti-Tank (HEAT) warhead which can penetrate up to 400 mm of conventional steel armour. This was followed into service several years later by the 9M111-2 (AT-4b 'Spigot') version which has a greater effective range (2,500 m as against 2,000 m) through the use of an improved solid propellant sustainer rocket motor and lengthened guidance wire. The family has subsequently been increased with the production of the tandem HEAT equipped 9M111M Faktoria (an AT-4c 'Spigot' variant, see separate entry). 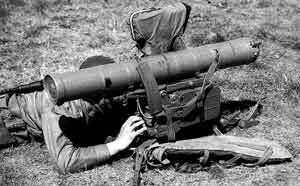 The original man-portable firing post was the 22.5 kg 9P135 system with a 3 rds/min rate of fire. 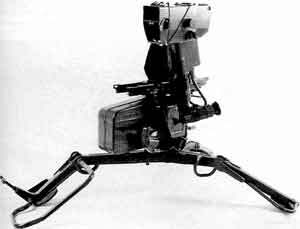 The 9P135 consists of a tripod, a 9S451 guidance controller box fitted to the tripod with an attachment for the missile canister immediately above and a9Sh119 optical sight unit attached to the left side of the launcher assembly. The 9P135 can only fire the 9M111 missile variant. A gas generator system is used to expel the missile from the canister to a safe distance where the solid propellant rocket motor ignites. The expulsion of the gas generator backwards also acts as a counterweight to reduce the recoil on launch. The follow-on launcher post system was the 9P135M which introduced common interfaces so that the 9M111 Fagot, 9M111M Faktoria and 9M113 Konkurs missiles can be fired. The 9P135M was then upgraded twice with the 9P135M1 and 9P135M2 firing posts being produced. The latest model, the 9P135M3, appeared in the early 1990s and is a night-capable system. A 13 kg TPVP thermal imaging night sight assembly has been added which clips on above the 9Sh119 sight. Using this the 9P135M3 has an effective night-time engagement range of 2,500 m. A further upgrade has been made to the 9S435 guidance control box to harden the missile guidance against electro-optical dazzler-type countermeasures and with this fitted the total missile firing post weight is increased to 23.5 kg (plus an additional 13 kg for the night sight unit if fitted). Bharat Dynamics Limited of India with Euromissile have developed the Flame-V and Flame-G adaptor kits to allow the 9P135 series of firing posts to fire the Euromissile MILAN 2 missile (see entry in this section under India). The 9K111 system was used to upgrade older BMP-1 ICV and BMD-1 ACV tracked vehicles. The conversion involved the removal of the 9K11 Malyutka (AT-3 replacement by an attachment post for the upper portion of the 9P135 series firing post. The tripod section of the firing post remains in the vehicle troop compartment and can be used for normal manportable operations with the dismounted upper part as required. The modified vehicles are known by the designations BMP-1P and BMD-1P (P = poluavtomaticheskiy, Russian for semi-automatic guidance). Based on the 4 x 4 GAZ-41-08 chassis, the BRDM-3 two-man vehicle has a five-rail 9K113 launcher mounted on its roof. It has an automatic reloading system which takes 25 seconds to reload all five rails. An electro-optical tracker is mounted on the right side of the vehicle superstructure. A warning system is fitted to alert the commander-gunner to any optical jamming that may occur. This allows him to switch to a simple manual wire-guidance mode if required. The 9P148 normally carries a total of 10 rounds of each missile type internally, with the inner three rails the ones usually seen fitted with the 9M111 series container-launcher tubes. 6x6 SISU XA-180 (single-tube launcher).